The Ultrafast X-Ray Summer School (UXSS) is an annual school on X-ray science aimed at PhD students and postdocs. The program of the school consists of nine lectures given by distinguished scientists in the field, a one-day visit to European XFEL with instrument presentations and tours, and guided hands-on project work in which the participants work out a mock proposal for beamtime at European XFEL. We hope to see you in Hamburg in June! The Center for Free-Electron Laser Science (CFEL) at DESY in Hamburg, Germany hosts the Ultrafast X-ray Summer School 2019. 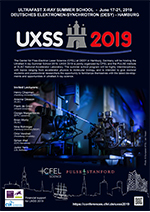 UXSS 2019 is jointly organized by CFEL and the PULSE institute at SLAC National Accelerator Laboratory. We would like to express our thanks to the JOACHIM HERZ STIFTUNG, who kindly provides financial support for UXSS 2019!